Is a True Andean folk music band. 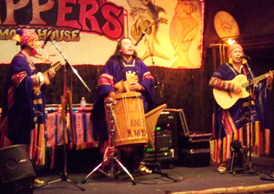 INCA SON is a true Andean folk music band. The three piece team that is in this article is part of a usual 6 piece group that includes dancers and more. With over 10 cd's to their credit, this group has played venues from Moscow to the Boston Pops. 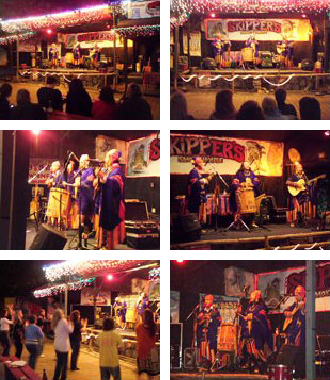 Skippers Smokehouse and Tampa based support groups for the people in the Andean regions of South America are where you will find them locally. Pan flutes, drums, guitar, and a mandolin are the mainstays of their unique sounds. The native costumes bring your attention to the idea that you are definitely in for a different show. The harmony and character Inca Son presents at their shows is part of the enjoyment and we are happy to be able to share that with you here. Visting Tampa only about once a year, their next visit (not yet scheduled) should not be missed.